Vol., The database is a simple application that allows you to store the (number) Volume of books and magazines, to manage. 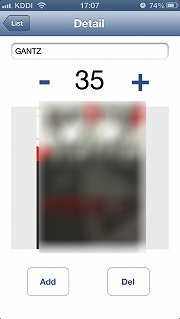 It is possible to register not only the (number) Volume, but also cover photo, will no longer buy the same volume twice already. [-] [+] When you tap the button, you will be able to change the (number) Volume. By tapping the [Add] button, you can create a photo. 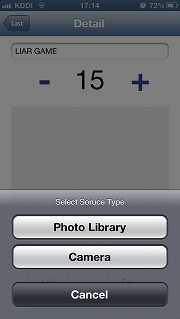 You can select photos from your Camera or Photo Library. By tapping the [Dell] button, you can delete the photo.